Itunes is an important application to all types of iDevices manufactured by Apple Inc. These iDevices may include the iPhone, iPod, iPod touch, and iPad. Itunes is used in playing music and video files. The application is also useful when a user wants to synch, connect, and transfer all media files the iDevice to the computer. With the Itunes, users may also restore the original settings of the iDevice according to the configuration outlined by Apple Inc. Aside from restoring, iTunes also lets user upgrade the baseband or firmware version of their devices. Like other software or hardware out there, iTunes can also prompt errors. These itunes errors may occur when the requirements or there is something wrong either in the device, application, or the computer. These errors may include the number 1103, 2003, and 1161. Errors may be considered hardware or software in nature. Users may also encounter account issues in using the iTunes. They may experience that their itunes account has been disabled even if they did not intend it to do so. If you wanted to know how to deal with iTunes account disabled problem, continue reading the article below. Because it talks about the account, the itunes account disabled problem may be considered software in nature. The iTunes account is also known as the Apple ID, the name of its manufacturer. 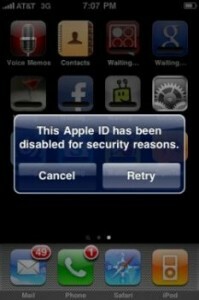 Let us talk about the signs that your Apple ID or iTunes account is disabled. Your ID will be disabled if you have entered a wrong password several times. Apple usually disabled itunes account id for the safety of the user. However, this does not mean that the account is totally disabled. The first thing you need to do when you got itunes account disabled problem is to reset the password using iForgot. You can access iForgot at http://www.iforgot.apple.com and reset your password. On the other hand, you can also click the Forgot Password or Reset Password buttons in the alert message that will pop up. If in case you reset your MobileMe password, you need to follow the following steps to update the configuration of your computer. If you are using the operating system Windows from Microsoft Corp., click Start and head on to Control Panel. In the Control Panel, click the MobileMe application and Sign in. Type in your new password in it. For those who are using the Mac OS X operating system, click the System Preferences at the Apple menu. Choose MobileMe then type in the new password and hit the Sign in button. In the iTunes menu, head to Settings then choose the General tab. Under the General tab, go to Restrictions and Enter Restrictions Passcode. A page will come up and you should be able to make purchases with that. I hope! You can contact the technical support team of Apple Inc. if you are still not able to solve the itunes account disabled problem issue. Good luck!